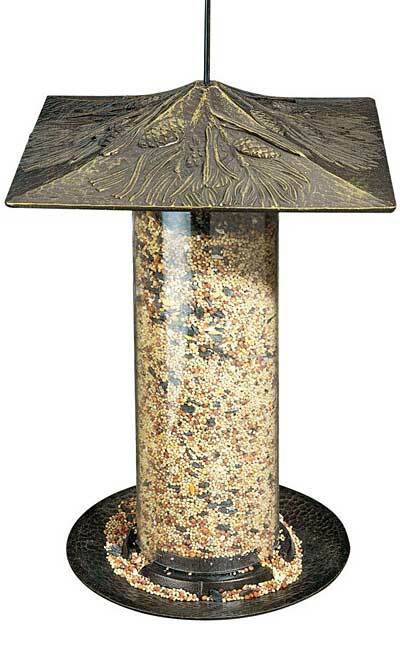 Watch the birds in your backyard feast from the Whitehall Pinecone Large Tube Bird Feeder. Three dimensional pinecones, needles, and branches seem to dance across the 9.5" square roof, which protects the seed from the elements. The clear plastic tube holds 2.25 quarts of seed, and offers easy monitoring of feed levels. The three small ports at the base of the tube allow birds to have easy access to the seed, and the round 8.25" diameter base acts as a perch for your feathered friends. Simply slide the roof up the included black powder coated steel hanger for easy cleaning and filling. The recycled aluminum roof and tray are weather resistant and will provide enjoyment for many years. Enhance your bird garden with this Pinecone Large Tube Bird Feeder. Made in the USA. Capacity: 2.25 qts., 3.3 lbs.